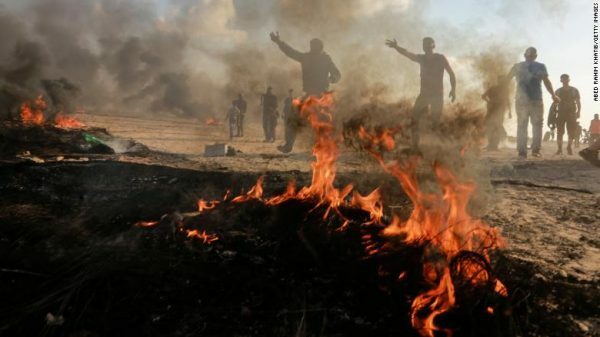 Palestinian demonstrators burn tyres to protect themselves from Israeli forces’ snipers during the “Great March of Return” on the Gaza-Israel border in Rafah, Gaza on October 12, 2018. Seven Palestinians died Friday after being shot by Israeli soldiers along the security fence between Gaza and Israel during violent weekly protests, according to the Palestinian Ministry of Health. A total of 252 people were injured — 154 of them by live fire, the ministry said. The deaths occurred during Friday protests, which often turn violent, along the fence separating Israel and the Gaza Strip. The ministry identified the victims as Ahmed Ibrahim Al-Taweel,27; Mohamed Abdelhafez Ismail, 29; Tamer Riad Armaneh, 27; Afifi Mahmoud Afifi, 32; Ahmed Abdullah Abu Naim, 17; Abdullah Suleiman Al-Daghma, 25; and Mohamed Esam Abas, 21. The Israel Defense Forces (IDF) said about 15,000 Palestinians gathered along fence. “The rioters are burning tires and are hurling rocks, explosive devices, firebombs and grenades at IDF troops and the security fence,” according to an IDF statement. CNN crews witnessed Palestinians burning tires, and burning the border fence — with Israeli forces responding with tear gas, live fire and a water cannon. Following the protests, Israel’s minister of defense, Avigdor Liberman, announced that the flow of diesel fuel into Gaza would be stopped immediately. Tankers of diesel fuel, funded by Qatar, had entered Gaza over the last few days, as part of an attempt to improve humanitarian conditions in Gaza, which has only a few hours of electricity a day. The protests are a continuation of what Gazans dubbed the “March of Return,” a series of protests that began in late-March, aimed at highlighting the right claimed by Palestinians to return to homes and villages lost seven decades ago in the war that accompanied the founding of the state of Israel. The protests have regularly occurred on Fridays, with as many as tens of thousands of Palestinians gathering at multiple locations along the Gaza fence. In recent weeks, protests have begun occurring on other days as well, ratcheting up the tension between Israel and militant factions in Gaza, led by Hamas. Israel asserts it is protecting its sovereignty from violent rioters. During one protest in July, a Gaza sniper shot and killed an Israeli soldier. The last few months have also seen Gaza militants fire more than 100 rockets and mortars into Israel, which has responded with dozens of air strikes. So far, Egypt and the United Nations have been able to stop events from escalating further by carrying out truce talks. The importing of fuel into Gaza was intended to relieve the humanitarian situation there and reduce tensions in the coastal enclave, allowing the possibility of a more wide-scale agreement between Israel and Hamas. 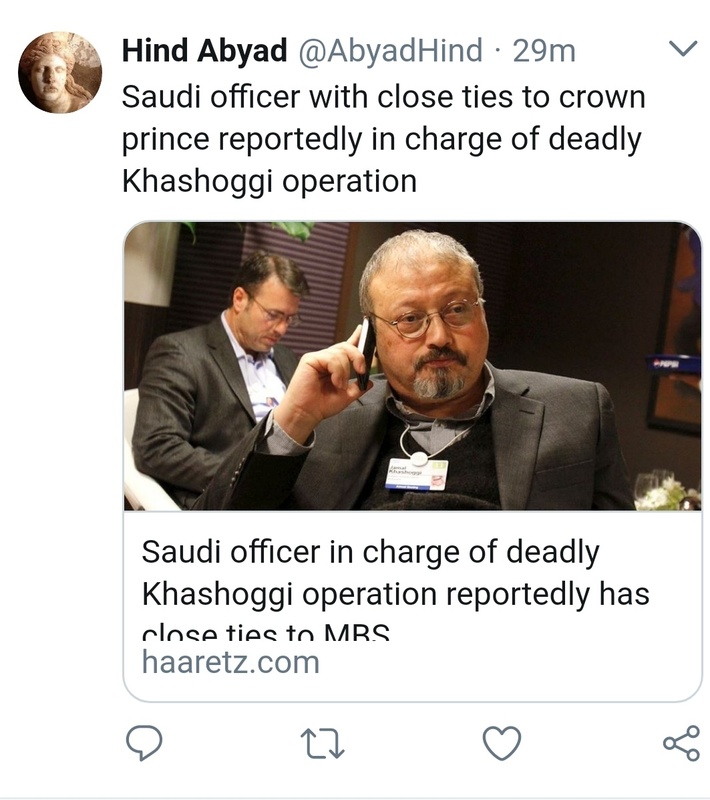 Dumbyad is fulltime engaged on Twitter ????. The usual pathetic behavior from Lebanon…. “Systematic torture” in Palestinian prisons. 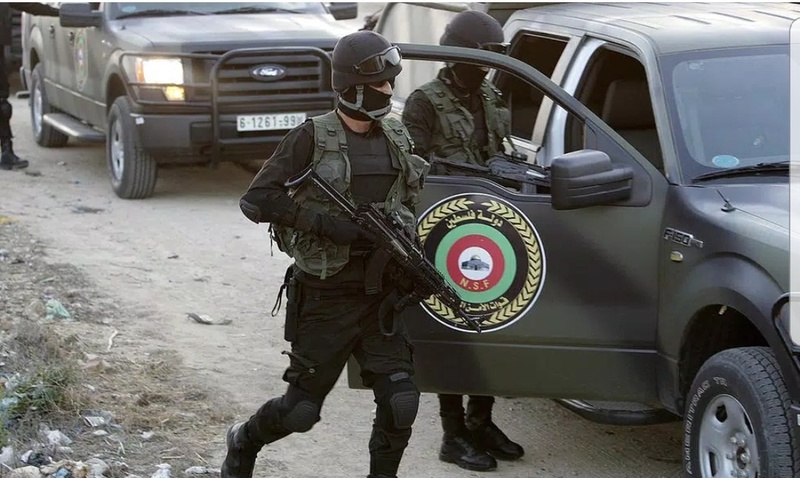 The Palestinian Security forces expel prisoners for systematic abuse and torture crimes against humanity, according to Human Rights Watch (HRW). Both the Palestinian government of the West Bank and Hamas in Gaza use threats, arbitrary arrests and violent abuse of detainees, HRW writes in a report. “Systematic torture as part of an exercise of authority is crimes against humanity,” says Omar Shakir, Israel’s Palestine chief. According to Omar Shakir, the torture in Palestinian prisons undermines criticism of Israeli human rights violations. “Palestinian leaders travel around the globe to talk about Palestinian rights while leading a machinery of oppression to crush dissidents,” said Shakir.